The Halifax Mooseheads and Cape Breton Screaming Eagles have been facing off against one another for 21 years. However, there’s been enough history between the two clubs to last a lifetime. This weekend, the Moose and Eagles tangle once again in a home and home series that begins at Center 200 on Friday night at 7pm AT. After an arduous 15-game road trip, the Mooseheads will open their home schedule in the return match on Saturday night at Scotiabank Place, also at 7pm AT. 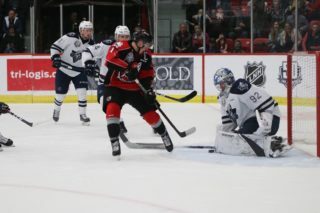 The two teams previously faced off during the 2018-19 campaign on September 28th in Sydney, a 4-2 Mooseheads victory. The Mooseheads are currently celebrating their 25th season in the league. 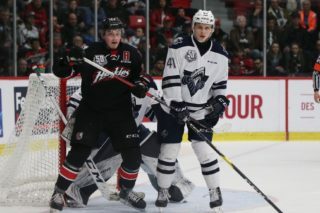 The first ever Maritime-based QMJHL franchise, the club has appeared in three President Cup Finals, capturing the league championship in 2013. The Screaming Eagles have been calling Cape Breton home since 1997 and have been another success story for the league in Atlantic Canada. 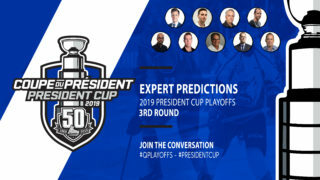 During that time, the team has registered 40 wins in six different seasons, reached the President Cup Semi-Final twice (2002 & 2007), and have produced four first round NHL Draft selections, including first overall pick Marc-Andre Fleury (2003). From day one, these two teams have developed what could modestly be considered a healthy rivalry. 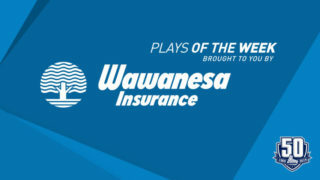 Be it the pure skill shown in three playoff series between the two clubs, any number of examples of overt physicality or even drama off the ice, this is one competition that has definitely seen a little bit of everything. First, the playoffs. The Screaming Eagles captured the first series back in 2002, eliminating the Mooseheads in six games in a series that was punctuated by “the stick game”. With Mooseheads’ forward Derrick Kent sent to the penalty box for playing with an illegal stick, giving the Eagles a two-man advantage, Cape Breton cashed in with a pair of powerplay goals from Dominic Noel to cap a 3-2 come from behind win in Game 3 of that series. The following season, the two clubs locked horns again. The heavily favored Mooseheads would sweep the Eagles in 2003, with netminder Guillaume Lavallée pitching shutouts in each of the first three games of the series. 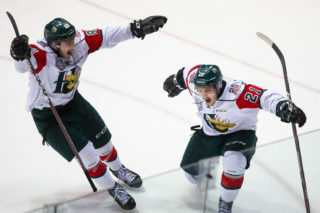 The last playoff encounter between the clubs occurred in 2008, a series won by the Mooseheads in five games and best remembered for Jacob Vorachek’s triple-overtime winner in Game 3 that changed the complexion of that series. There’s Eagles’ defenceman Thomas Kloucek’s controversial hit on Mooseheads’ scoring star Alex Tanguay. Or Halifax’s Carlyle Lewis’ epic New Year’s Day bout with the Cape’s Trevor Ettinger. How about the infamous pre-game dustup in Sydney on New Years Eve, 2000? That’s not to mention a trade that literally rewrote the league rule book that saw the Mooseheads send the core of their 2002-03 squad to Cape Breton the following year, only to see them return to the provincial capital in 2004-05 and ignite this mutual dislike once more. Chances are, if it’s happened in the game in the past two decades, it’s happened in the Battle of Nova Scotia. 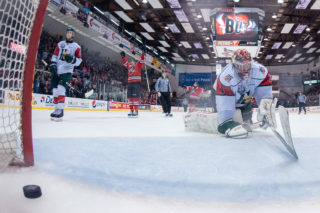 And it is under that backdrop that the 2019 Memorial Cup host Mooseheads and a Screaming Eagles squad still trying to find their footing in the early portion of the season face off. Make no mistake however, this is one rivalry worth the price of admission regardless of positions in the standings.